Merry will be available for adoption on my Etsy shop this Thursday Nov 10th at 9pm EST. Merry is a 16″ Button/String jointed doll. She is stuffed with a combination of wool and poly pellets to give her weight. I don’t have a scale to weigh her properly (sorry) but I would guess she’s just under two pounds, since she feels a bit lighter than my 2lb exercise weight 😉 The poly pellets really give her a realistic feel and paired with the button joints, she seems quite poseable. She has blue eyes and soft blonde mohair with a little bit of curl to the ends. She is sculpted for life-like details, fingers, toes, belly button, bottom and facial features. She does not have the magnetic inserts and will not come with a pacifier. 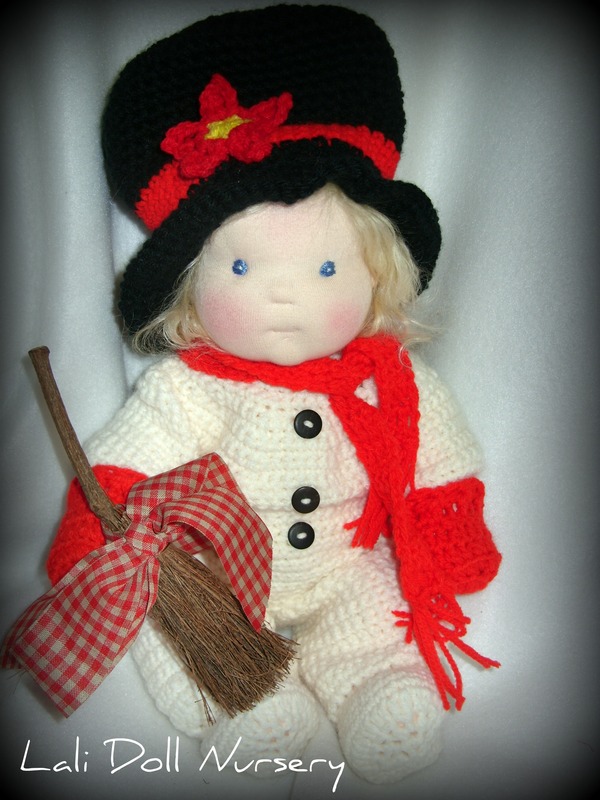 Merry will come dressed in this adorable “Sue’s Crochet Designs” snowman costume, which comes with a hat, footed suit, mittens, scarf and broom. Also, so she has something to wear after the holidays, she will come with her own receiving blanket, diaper, t-shirt and crocheted hat and booties.